Studying and doing your college homework are integral to your success. College is different than high school and the way you study may change. In high school, your teacher may have given you guided notes where you had to fill in a word here or there to complete the passage or they would just have you read a few pages. In college, you're going to have a lot more to read. Sometimes a hundred pages or more in a week and that could be for just one class. 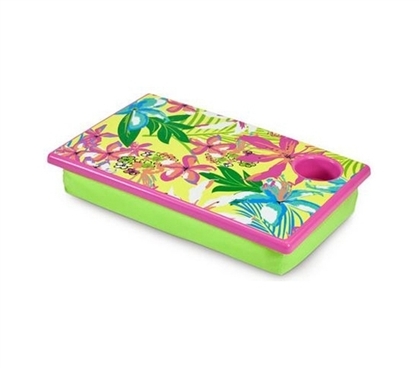 When you're dorm room shopping for your college supplies, you also need to think of dorm accessories that will make studying a little easier. Without further ado, DormCo presents you with a list of college supplies to make your life a little easier when you're studying. 1 - Lapdesk - DormCo has a variety of different lapdesks, from your basic cushioned surface to Lapdesks with fans built in to cool your computer and also lapdesks with LED lights. These are all great options and it simply depends on what you need. One thing is for certain, though - lapdesks are a dorm essential. When you're sitting in class all day in an uncomfortable chair, you don't want to go to come back to your dorm room and do the same at your desk. You will more than likely want to sit on your dorm bed or mini-futon and feel comfortable while you're studying. This is where your lapdesk comes in. You can keep the heat of your laptop off of your lap so you don't burn yourself and if you don't use your laptop on it, then it is going to provide a sturdy writing and reading surface that will elevate your notebook or college textbook so you don't have as much neck strain. Of course lapdesks are super compact and portable, which means you can even take this dorm essential to the college library. 2 - Organizer Light - It may sound silly that a light can help you study, but it's true. You really cannot go to college without an extra light or two. There's definitely going to be times when your roommate is going to sleep and you're going to stay up and read, do homework, or study. You can't leave the overhead light on when your roommate is sleeping, so you will need a dorm desk lamp to study by. Plus those dorm overhead lights don't put out much light anyways, so you will need a dorm desk lamp whether you plan on studying when your roommate is sleeping or not. DormCo carries a Stay Organized Dorm Desk Lamp that will make your dorm organization a lot easier. 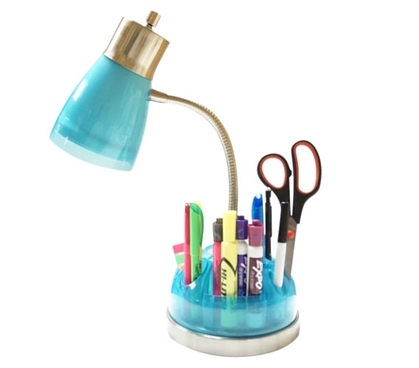 This dorm light is a dorm space saver and has a caddy around the bottom to hold your desk college supplies such as highlighters, pens, erasers, stapler, and other dorm essentials. That means when you're studying at your desk you will have what you need within arm's reach, you will have one less dorm item taking up valuable space, and you will have saved money by having two dorm essentials in one! 3- Bookmarker Flag Pen and Bookmark - This is a pretty awesome college supply that you will most definitely want for studying. It's three things in one! It's a bookmark to keep your place when you are studying and have to stop at a certain point. It also is a pen and has sticky flags so you can mark important things in your college textbook. You absolutely cannot go to college without sticky flags and sticky notes in your college supplies. You will use tons of these college supplies throughout your college life. More than you would ever think you would use. When you're studying you're going to do a lot of writing in the margins, highlighting, and then marking super important points with those sticky notes. With this dorm essential you will have three college supplies in one so you don't have to carry around multiple things when you're going to go to a coffee shop to study. 4 - Booksling - DormCo carries two Booksling varieties to make studying a whole lot easier. You may even want both of these college supplies for studying! 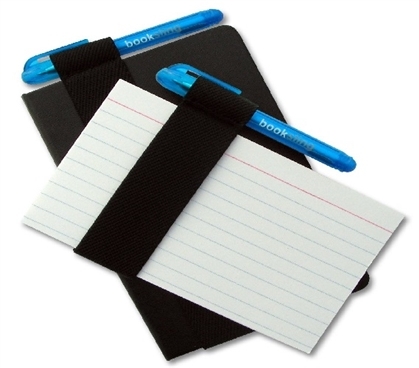 The basic Booksling is a pen holder and bookmark. It is an elastic band that stretches over your cover and pages to mark where you are at. However, there's also a ribbon attached so you can use the elastic or the ribbon as your bookmark. Or you can even use the elastic as your bookmark and stick the ribbon into the spot where you have to stop reading for class! On the top and bottom of the elastic are 2 loops to hold a pen and highlighter and yes, this works on hard and soft cover books! The second variation is the Booksling Mini which also has an elastic bookmark band and is for small books or notebooks. However an even better idea for this Booksling Mini is to wrap it around index cards for studying. 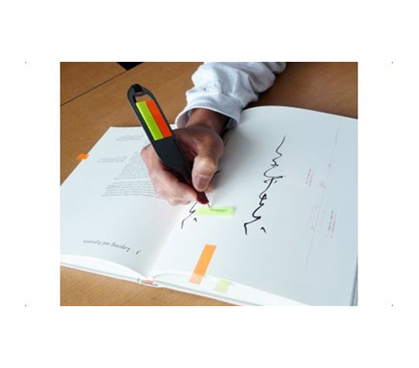 The Booksling Mini also has a loop for a pen and even comes with a pen! 5 - StudyPod - This is a pretty cool dorm essential. 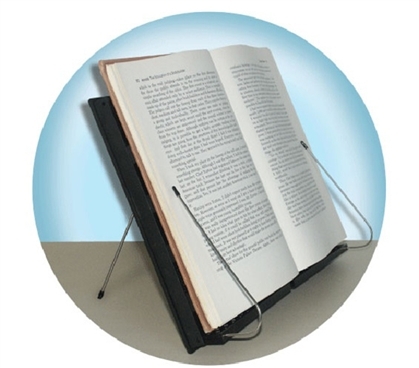 This provides hands free reading and holds almost all textbooks. That means you don't have to hold the page in your textbook or stick your smartphone on it to keep your page. This is a perfect dorm item for multitasking. You can read and type at the same time and it declutters your work space. In fact, you will have more work space because this dorm essential is holding your college textbook for you and preventing eye and neck strain! It's even super compact so you can bring it to class. Your classmates will be jealous as they're sticking pens in their college textbooks and you're doing hands free reading. It gets even better - the inside of this StudyPod has extra dorm storage compartments so you can keep your pens and highlighters within arm's reach where they won't roll off the table or you can even keep your iPod or Smartphone in the convenient storage pocket.